This isn’t the most technically adept or best looking game in the world, but I think it’s fun to play. The gist is that you draw enclosed shapes on the screen to capture Stars. The more Stars in your shape, the more points you get. UFOs extend time, but Comets, which bounce all over the place, will reduce time. While you can always try to capture as many Stars as possible in each shape, precision is also rewarded by capturing the number of Stars shown in the “Star Bonus,” which adds yet another score multiplier. It looks fun, but I don’t have an android device to play it on. Nor do I, I just used an emulator called BlueStacks, much cheaper than getting a smart phone. Gave it a go, pretty decent. Without reading the description it’s not very obvious what the UFO or comet do, I would suggest perhaps giving the comet an angry face in keeping with the visual style of the stars and to better communicate that the comet is a bad thing. Also I noticed you get a “star bonus” for collecting a precise number of stars (given in the top left corner) but this doesn’t seem to be reflected anywhere in the scoreboards and you seem to get more points just collecting as many as possible you say this gives you a Score multiplier but during play this is not clear I would suggest having a prompt come up to say what the current multiplier is for the duration of its effect. I would also suggest that the AI leader board scores are a bit low, I topped the leader board on my first go. But yeah, pretty fun distraction. Curiously, I never thought about putting faces on the comets, but that’s a good suggestion. The bonus goal multiplier is x10 to whatever the normal score would have been for that Star (which, itself is base value x current level x number of Stars in shape). So for it to pay off with lower counts, you need to catch big Stars. The floating score text actually used to show this logic (“200 x 10” then switching to “2,000”), but at some point I thought the player isn’t going to stand there and look at the text. That’s why “Great Combo” was used to tell the player they did good, even if the reason isn’t spelled out. I think the highest score I ever accomplished was 50M and I survived for about 7 minutes. Because the system is somewhat exponential, if you can scrape by the timer at the end, you can get 1-2M combos easily. That’s a nice idea. Good luck with it. I believe that limitations drive creativity. As such, I am always more impressed by those who can make older tech sing compared to those who can build anything they want with new tech. Amen. I find that limitations enhance focus. Everywhere, not just in mapping. The movie poster you put up is nice! 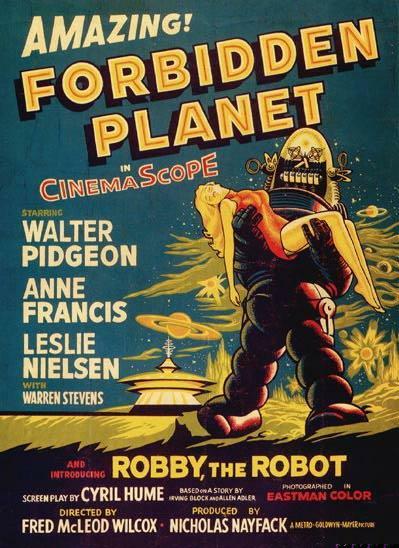 I saw that movie (Forbidden Planet) when it first came out in 1956, I was 10 years old at the time!! My how time flies! Thanks for the reminder of the game “TimeShift” I had forgotten all about it, played through it 2 times very good, IMO. Hope that HL3 comes out before I end up in a nursing home!! That girl from Phase IV was (and still is really) a fantasy of mine. Ep1 and Ep2 keep closing on me about half a second after the menu screen loads, with no error message or anything. HL2 starts though. I’ve deleted local content, verified the cache and restarted Steam and the PC – still happens. One strange thing is that it opens in a window even though I removed that option from the start up parameters. I had to add “-fullscreen”. Drivers? Uninstall then reinstall them and maybe that’ll fix things up. I haven’t tried that but why would HL2 work but not Ep1/2? I had some trouble yesterday with half life, but I got some error messages about shared content with Half Life 2 and then with Steam VR (I don’t have VR) I deleted the local files for all 3 games throught steam and then manually deleted anything remaining in the folders. Though it might not come to that with you. Thanks for that. Unfortunately, it didn’t work. After doing it and trying to run Ep2, it said I had an issues with shared content from Half_life 2 and that must be updated. When I tried to run Half-Life 2 it said I had an issue with SteamVR and that needed to be updated, even though it wasn’t installed. I installed that but Ep1 and EP2 still don’t work. I am going to uninstall steam and start again and if that doesn’t work, I’ll call Gabe at home at 3:00am and tell him to fix the damn thing. huh, that was what Steam support told me to do. It sounds like you are having the same issue as I was, unfortunately I got around that by uninstalling all three episodes and deleting any trace of them in the steam apps folder and then I reinstalled it. Though Steam support replied after I had fixed it my own way. Please exit Steam and go to the folder called C:\Program Files\Steam\ (this is the default location for a Steam installation – if you set a different installation directory, you will need to browse to it). I’ve already fixed my issue by reinstalling all HL2 games but if anyone else is having this issue I hope this helps. Yes, the -window option stays even tho it’s removed, and is turned off only by specifying -fullscreen at least once. About the crash, I had an issue but with an error after the crash, and validation worked for me, it made ep2 re-download some files. Why not just write steam support, attaching the .dmp file? It’s being made by Gambini, who was joint winner in ElevatorVille. Odd, the moddb page doesn’t feature this and last update was 2 years ago… no wonder I never heard of it. That’s because PP is the first place to publish it. It certainly looks pretty. He’s getting the most from the 2013 engine by the looks of it. I was hoping it´d make it to the news and not just a post on the general chat thread. But well, at least a few fellas noticed it. Return to Castle Wolfenstein for £1.49. Sounds like an absolute bargain to me. I still have my original game cd and books, got em in 2001, still a good game!! I REALLY wish Lifeless Planet were first person. I think I would buy it. I just can’t get on with third person views. Battlefield Hardline…Its even worse than Call of Duty at this point. I’m really trying but I can’t see the difference between BF3, BF4 and Hardline. New guns and vehicles! Yay! I want to pay 60 dollars to get a few new cars! Complete Valve pack for £14.45. OMG, what a bargain. Wish I could buy it for a prize but when I try it says 89.99 Euros. Has anybody else seen this Minecraft-maker releases Cliffhorse spoof video game on the BBC website? I see his point but isn’t it a little ironic seeing as Minecraft was one of the first big “early access” games? I don’t think this How to pick the perfect video game image is very good. I followed HL2 back until “Do you want to lose yourself in another world?” and to lead to HL2 it said NO. Seems strange to me. Piece on the BBC yesterday about Why does sexism persist in the video games industry?. I haven’t read it all yet. Like I said before, in FPS’s where you can’t see your playermodel it barely matters the gender of the character you’re playing, especially when it’s a silent protagonist like in HL and when the story is good enough and the gameplay immersing enough to make the player identify themselves with that character. That article has some interesting statistics, but they do remain just that and their veridicity is questionable or at most, the high percentage of female gamers at this time needed explaining, namely the data was gathered from mobile games as well where very few have any player character to begin with, from what I can recall. Fact: I for one play as a female character daily in HL2: DM but only because the first player model alphabetically available is the female01 rebel. And when I would play servers with custom skins I would not be bothered to have only 2 female player models to choose from, nor went for them first or anything like that, they’re there like any other model and seeing it only when I die would not make much of a difference to me. As for the harassment part in multiplayer, I will skip my thoughts on that 1 as it’s barely mentioned anyway and it would just be the nth rant about it. I won’t go into too many details here, but the sidebar now contains a new section called Current Live Streaming Event. Having learnt about Live Streaming recently, I have decided to live stream the preparation of the larger mods. Some of the times will inconvenient for my viewers but all streams are uploaded to my YouTube account, which will also act as a walkthrough for the mods. Anyway, have a look and tell me what you think. Okay, spill the beans. Who is buying what in the Steam Summer sale? I’m tempted to buy some games for prizes but not really for me. I think the only game I want is Wolfenstein: New Order but I want to play a demo first. I apparently can’t run the new Wolfenstein on my PC, so I’ll probably end up getting it on PS4 at some point, though I’m in no hurry to since I have plenty of other games already in the queue. I’ve heard lots of great things about it, though, but without mod tools, my excitement can only go so far. I figured I’d buy the rest of the mission-based Borderlands 2 DLC to co-op with. There’s not a whole lot on my list, to be honest. I’m planning on BioShock 1 and Dishonored. How about 0? And we do a HOF re-play event, 1 year each weekend? That sounds like a great idea. I’ll ponder and see how I could do it. OH, BTW, Opposing Force for under two euros is an absolute bargain. I have a few HL2 mods/maps that aren’t on the site. Sorry if I’m being stupid but I can’t find any contact info. You can send me an email to planetphillip@gmail.com and I’ll have a look at them. Thanks. Any chance the next competition will take place over the summer? I finally have some time off and it would be fun to make a map with a set theme! The next comp will probably start on 4th July, but I am just waiting for confirmation. They may also be one in August too. I am finally finished with exams today. I would have liked to enter the last competition but I’ll have to wait for the next one. Looks like there’s plenty of new mods to play in the meantime though! There are some nice Steam Grid View of the Half-Life 2 games here on Imgur.com. I found them after browsing a site called Steambanners.booru.org which was completely new to me.